At 3 weeks rental, you have no mileage limitation !! Our RV - model 2011 - rent means luxury that you can enjoy a break from all that Europe has to offer: mountains, beach, sea and cities. The dimensions of the camper 6,89m. (Length) and 2,30m. (Width) and 2.75m (height) guarantee plenty of space for a carefree holiday. Lots of comfort you experience in that the chassis has been lowered and the rear breedsporig. Wherever you decide to go on holiday, you drive always with pleasure in this motorhome, whether it's flat roads or driving in the mountains. 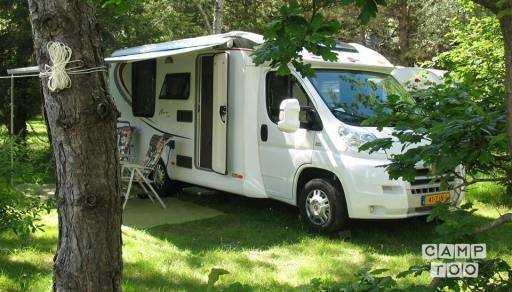 Want to next year 2, 3 or 4 weeks in high season with our two-person motorhome on the road? Then if you book before January 1 will give you € 250.00 discount on your fare. With 2 weeks rent you receive € 150.00 discount on your fare. The condition is that 50% of the price excl. The deposit for February 1st is credited to our account. Skylight above the Queen-equipped Turbo guy. The owner of this camper offers pick-up and drop-off services. The costs for this are £271.36.